English Mokes were the first Mokes to be produced. Officially called ‘Mini Mokes’, they were built by BMC (the British Motor Corporation) at the same factories as the Mini. A Moke built at Longbridge was an Austin, while a Moke from Cowley was a Morris. In all other respects, the Austin and Morris Mokes were identical. The English Mokes are the most basic of all the Mokes. Standard equipment was sparse: the original cars had just one windscreen wiper, a driver’s seat (passenger seats were extra), no heater, no seat belts. Only the ignition switch required a key as nothing else was lockable. With the hood folded down at the back of its very low bodywork, the English Mini Moke is probably the most open car you can get! 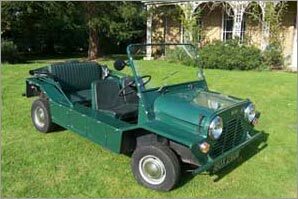 Apart from a few changes made in 1967 (see below), the following features will help identify an English Mini Moke. Remember, there was an overlap between the end of production in England and the first years of production in Australia, so early Australian Mokes were very much like English Mokes. You should also remember that many Mokes will have been modified from their original specification over the years. 850 cc. Correct engine numbers start with an ‘8’. Drums all rounds. Drums have a ‘flat’ face (ie there is no spacer built into the casting). Straight tubes each end. The front bumper has triangular brackets which bolt directly to the front panel; the rear bumper has straight brackets which bolt to the body at the bottom of the rear panel. The grille in the front panel is fixed - ie it is part of the front panel itself. The rear panel is vertical, with rounded bottom corners, and no ‘flared’ sections for the rear wheels (which were found on Australian Mokes with 13-inch wheels). While most Australian Mokes (except the early ones) and all the Portuguese Mokes had extensions to the wings to make them about 4 cms wider, the wings of English Mokes did NOT have these extensions. This was mounted in the left-hand ‘pannier’, with a large round filler cap on the top surface of the pannier. (Early Australian Mokes also had this style of tank and filler cap; other Australian Mokes and all Portuguese Mokes had the filler on the outer side of the pannier). Indicators and side lights in one round unit, the top 2/3 is for the indicator, the bottom 1/3 is for the sidelight. 2 round lamps and one round reflector laid out in a triangular group at each end of the back panel. One of the lamps in each group is amber (the indicator), the other red (the stop and tail lamp). Seat(s) are made of shaped sheet metal. Cushioning comes from removable pads. Steering wheel (as original) is a large, 2-spoked, plastic wheel. Centre has either the Austin crest or an ‘M’ (for Morris), as appropriate. a ‘blank’ top left (on single wiper Mokes) or a toggle wiper switch (on twin wiper Mokes). The horn push is in the centre of the wheel. A single stalk (with green light at the end) operates the indicators. A floor button (next to the clutch pedal) switches the headlights between dip and main beam. A multifunction stalk is fitted: horn push is at the end (no green light - this is moved to the top of the speedometer); dip/main beam/flash switching obtained by pushing the stalk away from you or towards you. Originally a single wiper in front of the driver only, with the motor mounted to the ‘dash’ directly behind the wiper shaft. Round mirrors were mounted to sides of the windscreen frame. No central rear view mirror was supplied. The factory provided a hood, but no side-screens. The hood was mounted on folding ‘hoops’, which meant the hood could be folded right down behind the rear seats (if fitted), like a convertible. The hood had a distinctive tapered rear panel, which narrowed towards the bottom where it was fixed to the Moke body. Another distinctive feature was the split rear window, divided horizontally to aid folding.